Not many country towns can boast a winery on the main street, but at Heathcote it's a part of the scenery. 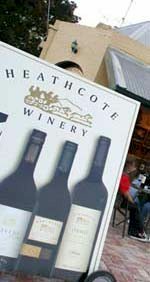 Heathcote is renowned throughout the world for producing much of Australia's finest Shiraz. Enter the Cravens Place, an elegant effort, stylish and quintessentially Heathcote. Sourced principally from sites at the warmer, northern periphery of Heathcote township, Craven's Place is fashioned to be a supple, bright and approachable wine. Ageing in choice oak barriques contributes to the complexity and allows the quality of Shiraz to realize its full potential. Heathcote Winery is meeting the demand for wines that are truly reflective of the region, but with the individual stamp of innovation and excellence. Low night time temperatures contribute to vine balance and excellent berry development. Picking is all done by hand, fruit is delivered to the winery where juices are extracted from the grapes by pumpover in closed tanks and hand plunging in open bins to extract optimum colour and tannin. The finished wine is matured sixteen months in a selection of French and American oak barriques. Brilliant ruby red with purple hues. Lifted blueberry and forest fruits dominate the nose, over a backdrop of spicy vanillin and plums. Bright fruits fill the palate, framed by chewy, fine grained American and French oak and supported by crisp natural acidity. A lively, medium bodied Shiraz, fleshy and dense in flavour, Craven's Place finishes long with persistent primary fruit characters over supple tannins.